The Papillon is a happy, lively, outgoing, affectionate lapdog who also loves to run and play--especially outdoors! He loves to cuddle and give kisses, and can be a calm, gentle and patient companion. But he's also a high-energy, fast-moving, go-getting athlete who needs a fair amount of exercise. He's always ready to play in the house and romp and roll around on the floor. He loves to take long walks, or to compete in dog-sports like agility. He is extremely easy to train and highly obedient: he has been named the number one toy obedience breed. He is very eager to please you and quick to learn new tricks. He craves the companionship of his owner and wants to be with you as much as possible, and needs to give as well as receive lots of attention and affection. He is very friendly with guests and will welcome them with polite kisses. He makes an excellent therapy dog. He is a good watchdog who will sound the alarm if something suspicious is happening. Sometimes he can bark too much, but he is not a yappy dog. He can sometimes take a while to housebreak, and is occasionally stubborn. He needs a daily walk and should always be leashed when outdoors, or allowed to play in a safely fenced area. You will need to check for small openings and holes in your fence that might allow him to get out. You need to supervise him around larger dogs, since he may bark sharply or jealously toward them and they can intentionally or unintentionally hurt his small body. He can be good with cats if raised with them, and is fine with smaller dogs. He is not recommended for young children because of his smallness and delicacy, but he loves older, well-behaved children. Both adults and children must be careful not to let him jump from high places, since he might hurt himself. He is a high-shedder, and so is not a good pet if you are concerned about dog-hair in the home. 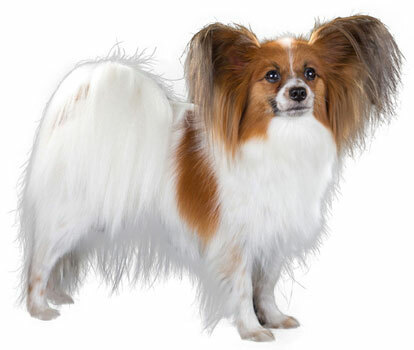 The Papillon is 8 to 11 inches tall (to shoulders) and weighs 8 to 10 pounds. He has a medium-length, silky, flowing, straight coat. His coat is always multicolored, and may contain white with black, lemon, red, tan, brown, sable or silver. He only needs an occasional brush-over. But because he sheds like there is no tomorrow you might find yourself preemptive-brushing daily (brushing to remove the dead hairs before they fall out around your home). The Papillon, which means "butterfly" in French, was named for his upright, wing-like ears. He is a member of a very old breed first known as the "dwarf spaniel," and his image can be seen in Italian art going back to the 13th century. He was the favored pet of European nobles and royalty, and was popular in Spain as well as in France and Italy. Marie Antoinette owned a Papillon, and many Papillons from Spain were sent to the French court of Louis XIV. The "Pap" was also once used as a ratter, since he was good at chasing, catching and shaking mice. He was first registered with the AKC in 1935. His AKC popularity was 36th out of 157 breeds in 2007.